When we moved into our house we were delighted to discover that we had a sour cherry tree in our back yard. Incredible. Cherry pie is hands-down my favorite! 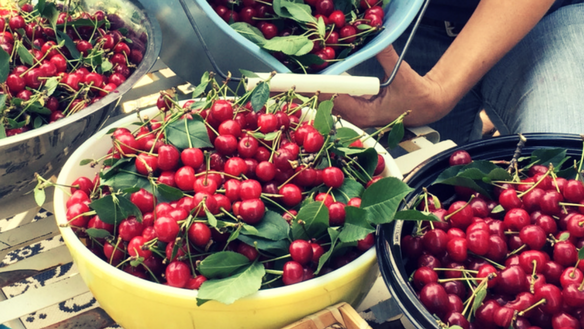 Every June since, we’ve gotten the whole family involved, climbing in the tree and on all sorts of ladders, picking as many cherries as we can. Then my wife goes to town on making me my cherry pies. What would a cherry pie be without the cherries? Any talk of culture building and shaping within a church in order to help a congregation get on the mission of God, could begin to sound just like any secular self help book—as if being the church together only requires the latest leadership techniques and cultural insights. But the church is not a business and we aren’t growing an enterprise. We’re mobilizing people to change the world with the gospel. And this will only happen if the Spirit of God surrounds our efforts. But isn’t that obvious, you say? Do we even need to mention it? Wouldn’t it be equally redundant to say that cherry pies are made with cherries? Perhaps. But maybe it’s the same reason my wife still looks at her recipe every time she makes one of her infamous pies. She wants to make sure. As simple as she says it is, she wants to remember to get it right—not leave out any key ingredient. The “recipe,” if you will, of the early church was Spirit infused and Spirit directed. The Holy Spirit was the key ingredient to the first believers’ movements. These earliest Christians waited for the voice of the Spirit, listened to it, obeyed it and consequently moved with a spiritual authority infused with the Spirit’s power. Think about the Christians in Antioch who were praying and fasting, and then heard the Holy Spirit tell them to set apart Barnabas and Saul for the work they were called to. In obedience to the Spirit, they then laid their hands on them and sent them off. Are we still mixing in the key ingredient of the Spirit’s leading in our leadership today? How many of our people are hearing the voice of the Holy Spirit directing them as they live, work, and play? Is teaching them how to do that part of what we are doing as leaders? How many more of our people would engage in the mission of God if they heard the Spirit telling them not only to go, but where to go? The Holy Spirit used that evening and a few other isolated moments like it to prompt some of our other leaders to walk our entire team through some teaching on how we can better hear and obey the voice of Spirit. Together, we are working through a process to teach us about how to discern God’s will, hear his voice, and become obedient to what we hear. I’m so thankful to God that after several months of this, that same Presbyterian is hearing the voice of the Holy Spirit and beginning to consider that even he is called to be part of God’s mission! He’s also excited for the rest of our congregation to grasp this, too. Don’t forget the cherries in your cherry pie.